If you think that being confined to crutches for an injury will offset your weight loss program, think again. Just because you don't have full mobility in your legs doesn't mean you can't do exercises and watch your nutritional intake in a way that facilitates weight loss. Weight loss simply requires that you burn more calories than you take in. In fact, a study published in the Journal of Orthopaedic Trauma found that walking on crutches can initiate an anaerobic exercise response within the body, so you may actually find it easier to create a greater calorie burn and lose weight while using crutches. Stay active. Resist the temptation to lay off and relax while you're injured. Work out by walking on your crutches or by using an arm ergometer--a kind of bicycle that isolates the upper body. Work up to using your crutches for cardiovascular exercise. You may find at first that the effort in your shoulders and arms feels too strenuous, so work in fits and spurts, walking for 30 seconds or a minute, followed by a short break, then another bout of activity. Lift weights while sitting on machines or benches. You can perform upper body and core exercises without risk of injury to your lower extremities. Perform exercises like chest presses, shoulder presses, lat pull-downs and abdominal work. Ask your doctor for clearance to perform specific lower-body exercises. Depending on your injury, your doctor may clear you to perform aquatic therapy or limited land-based exercise. Underwater exercises using either the water or a noodle for resistance can help keep your injured limbs mobile. Watch what you eat. Continue to eat a healthy and well-balanced diet. If you have already been watching your calorie consumption, compare your current exercise routine to your pre-injury routine. If you find yourself becoming less active, you may want to limit your calorie consumption more to ensure that you continue to burn more calories than you take in. If you suffered a bone fracture, make sure that you increase your calcium intake in order to facilitate recovery. 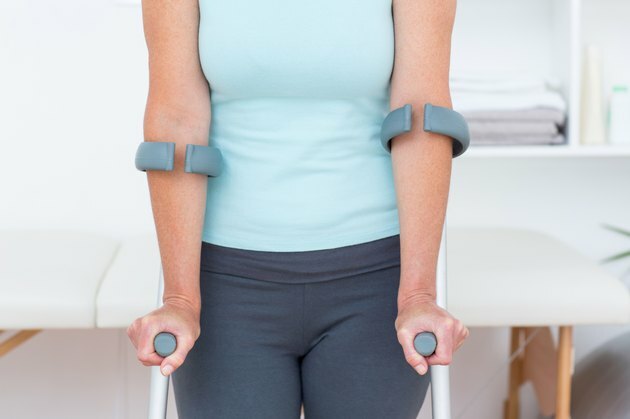 If you find that using crutches creates discomfort under your arms or against your sides, consider purchasing a crutch pad to limit unnecessary discomfort. Before engaging in any exercise program while injured, make sure you gain clearance from your doctor. You wouldn't want to overstress your injury and increase the length of your recovery time.